For the California Bay Laurel, see Umbellularia. For the Cherry Laurel, see Prunus laurocerasus. "Laurels" redirects here. For the greyhound race, see Laurels (greyhounds). "Sweet Bay" redirects here. For the town, see Sweet Bay, Newfoundland and Labrador. Laurus nobilis is an aromatic evergreen tree or large shrub with green, glossy leaves, native to the Mediterranean region. 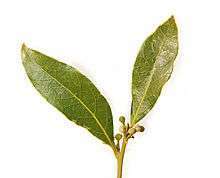 It is one of the plants used for bay leaf seasoning in cooking. It is known as bay laurel, sweet bay, bay tree (esp. United Kingdom), true laurel, Grecian laurel, laurel tree or simply laurel. Laurus nobilis figures prominently in classical Greek, Roman, and Biblical culture. Worldwide, many other kinds of plants in diverse families are also called "bay" or "laurel", generally due to similarity of foliage or aroma to Laurus nobilis, and the full name is used for the California bay laurel (Umbellularia), also in the family Lauraceae. The laurel can vary greatly in size and height, sometimes reaching 7–18 metres (23–59 ft) tall. Laurus is a genus of evergreen trees belonging to the Laurel family, Lauraceae. The genus includes three species, whose diagnostic key characters often overlap (Mabberley 1997). The laurel is dioecious (unisexual), with male and female flowers on separate plants. Each flower is pale yellow-green, about 1 cm diameter, and they are borne in pairs beside a leaf. The leaves are 6–12 cm long and 2–4 cm broad, with an entire (untoothed) margin. On some leaves the margin undulates. The fruit is a small, shiny black berry-like drupe about 1 cm long that contains one seed. A recent study found considerable genetic diversity within L. nobilis, and that L. azorica is not genetically or morphologically distinct. Laurus nobilis is a widespread relic of the laurel forests that originally covered much of the Mediterranean Basin when the climate of the region was more humid. With the drying of the Mediterranean during the Pliocene era, the laurel forests gradually retreated, and were replaced by the more drought-tolerant sclerophyll plant communities familiar today. Most of the last remaining laurel forests around the Mediterranean are believed to have disappeared approximately ten thousand years ago, although some remnants still persist in the mountains of southern Turkey, northern Syria, southern Spain, north-central Portugal, northern Morocco, Canary Islands and in Madeira. The most abundant component found in laurel essential oil is 1,8-cineole, also called eucalyptol. The leaves contain about 1.3% essential oils (ol. lauri folii), consisting of 45% eucalyptol, 12% other terpenes, 8-12% terpinyl acetate, 3–4% sesquiterpenes, 3% methyleugenol, and other α- and β-pinenes, phellandrene, linalool, geraniol, and terpineol, contains lauric acid also. Both essential and fatty oils are present in the fruit. The fruit is pressed and water-extracted to obtain these products. The fruit contains up to 30% fatty oils and about 1% essential oils (terpenes, sesquiterpenes, alcohols, and ketones). The plant is the source of several popular herbs and one spice used in a wide variety of recipes, particularly among Mediterranean cuisines. Most commonly, the aromatic leaves are added whole to Italian pasta sauces. However, even when cooked, whole bay leaves can be sharp and abrasive enough to damage internal organs, so they are typically removed from dishes before serving, unless used as a simple garnish. Whole bay leaves have a long shelf life of about one year, under normal temperature and humidity. Whole bay leaves are used almost exclusively as flavor agents during the food preparation stage. Ground bay leaves, however, can be ingested safely and are often used in soups and stocks, as well as being a common addition to a Bloody Mary. Dried laurel berries and pressed leaf oil can both be used as robust spices, and the wood can be burnt for strong smoke flavoring. Aqueous extracts of bay laurel can also be used as astringents and even as a reasonable salve for open wounds. In massage therapy, the essential oil of bay laurel is reputed to alleviate arthritis and rheumatism, while in aromatherapy, it is used to treat earaches and high blood pressure. A traditional folk remedy for rashes caused by poison ivy, poison oak, and stinging nettle is a poultice soaked in boiled bay leaves. The chemical compound lauroside B isolated from Laurus nobilis is an inhibitor of human melanoma (skin cancer) cell proliferation at high concentrations in-vitro. Bay is widely cultivated as an ornamental plant in regions with Mediterranean or oceanic climates, and as a house plant or greenhouse plant in colder regions. It is used in topiary to create single erect stems with ball-shaped, box-shaped or twisted crowns; also for low hedges. Together with a gold form, L. nobilis 'Aurea', it has gained the Royal Horticultural Society's Award of Garden Merit. Laurel oil is a main ingredient, and the distinguishing characteristic of Aleppo soap. Bay laurel was used to fashion the laurel wreath of ancient Greece, a symbol of highest status. A wreath of bay laurels was given as the prize at the Pythian Games because the games were in honor of Apollo, and the laurel was one of his symbols. The symbolism carried over to Roman culture, which held the laurel as a symbol of victory. It is also the source of the words baccalaureate and poet laureate, as well as the expressions "assume the laurel" and "resting on one's laurels". Ovid tells the story in the Metamorphoses that laurel tree was first formed when the nymph Daphne was changed into a laurel tree because of Apollo's pursuit of her. Daphne is the Greek name for the tree. An early Chinese etiological myth for the phases of the moon involved a great forest or tree which quickly grew and lost its leaves and flowers every month. After the Sui and Tang dynasties, this was sometimes connected to a woodsman named Wu Gang, sentenced to cut at a self-repairing tree as a punishment for varying offenses. The tree was originally identified as a 桂 (guì) and described in the terms of the osmanthus (Osmanthus fragrans, now known in Chinese as the 桂花 or "gui flower"), whose blossoms are still used to flavor wine and confections for the Mid-Autumn Festival. However, in English, it is often associated with the more well-known cassia (Cinnamomum cassia, now known in Chinese as the 肉桂 or "meat gui") while, in modern Chinese, it has instead become associated with the Mediterranean laurel. By the Qing dynasty, the chengyu "pluck osmanthus in the Toad Palace" (蟾宫折桂, Chángōng zhé guì) meant passing the imperial examinations, which were held around the time of the lunar festival. The similar association in Europe of laurels with victory and success led to its translation into Chinese as the 月桂 or "Moon gui". ↑ Brown, R.W. (1956). Composition of scientific words: A manual of methods and a lexicon of materials for the practice of logotechnics. Washington, D.C.: Smithsonian Institution Press. 1 2 3 4 Vaughan, p.150. ↑ Konstantinidou, E.; Takos, I.; Merou, T. (2008). "Desiccation and storage behavior of bay laurel (Laurus nobilis L.) seeds". European Journal of Forest Research. 127 (2): 125–131. doi:10.1007/s10342-007-0189-z. ↑ M. Moghtader; H. Salari (March 26, 2012). "Comparative survey on the essential oil composition from the leaves and flowers of Laurus nobilis L. from Kerman province" (PDF). Journal of Ecology and the Natural Environment Vol. 4. Retrieved October 19, 2014. 1 2 3 4 Green, p.19. ↑ Nayak, et al. (2006). ↑ Encyclopedia of Herbs. "Bay Laurel: Laurus nobilis". AllNatural.net. Archived from the original on 19 November 2010. Retrieved 2010-12-31. ↑ Panza, E; Tersigni, M; Iorizzi, M; Zollo, F; De Marino, S; Festa, C; Napolitano, M; Castello, G; et al. (2011). "Lauroside B, a megastigmane glycoside from Laurus nobilis (bay laurel) leaves, induces apoptosis in human melanoma cell lines by inhibiting NF-κB activation". Journal of Natural Products. 74 (2): 228–33. doi:10.1021/np100688g. PMID 21188975. ↑ "RHS Plant Selector – Laurus nobilis 'Aurea'". Royal Horticultural Society. Retrieved 21 May 2013. ↑ "RHS Plant Selector – Laurus nobilis". Royal Horticultural Society. Retrieved 20 May 2013. ↑ Brendon, Juliet & al. The Moon Year: A Record of Chinese Customs and Festivals, p. 410. Kelly & Walsh, 1927. Reprinted Routledge (Abingdon), 2011. Accessed 13 November 2013. De Cleene, Marcel; Lejeune, Marie Claire (2003). Compendium of symbolic and ritual plants in Europe, Volume 1. Man & Culture. OCLC 482791069. Green, Aliza (2006). Field Guide to Herbs & Spices. Philadelphia: Quirk Books. ISBN 1-59474-082-8. Retrieved 2010-12-31. Nayak, S; Nalabothu, P; Sandiford, S; Bhogadi, V; Adogwa, A (2006). "Evaluation of wound healing activity of Allamanda cathartica. L. and Laurus nobilis. L. extracts on rats". BMC Complementary and Alternative Medicine. 6: 12. doi:10.1186/1472-6882-6-12. PMC 1456996 . PMID 16597335. Wood, Jamie; Steinke, Lisa (2010). The Faerie's Guide to Green Magick from the Garden. New York: Random House. ISBN 1-58761-354-9. Retrieved 2010-12-31. Vaughan, John Griffith; Geissler, Catherine (2009). The New Oxford Book of Food Plants. Oxford: Oxford University Press. ISBN 0-19-954946-X. Retrieved 2010-12-31. Simic, M; Kundaković, T; Kovacević, N (September 2003). "Preliminary assay on the antioxidative activity of Laurus nobilis extracts". Fitoterapia. 74 (6): 613–6. doi:10.1016/S0367-326X(03)00143-6. PMID 12946729. Sayyah, M.; Saroukhani, G.; Peirovi, A.; Kamalinejad, M. (August 2003). "Analgesic and anti-inflammatory activity of the leaf essential oil of Laurus nobilis Linn.". Phytother Res. 17 (7): 733–6. doi:10.1002/ptr.1197. PMID 12916069. Sayyah, M; Valizadeh, J; Kamalinejad, M (April 2002). "Anticonvulsant activity of the leaf essential oil of Laurus nobilis against pentylenetetrazole- and maximal electroshock-induced seizures". Phytomedicine. 9 (3): 212–6. doi:10.1078/0944-7113-00113. PMID 12046861. Talmud Bavli; Pessachim 56a: Laurel extract is used as part of a mixture to assist in grafting Palm trees. Wikimedia Commons has media related to Laurus nobilis. Hogan, C.Michael (2010). "Laurus Nobilis L.". Encyclopedia of Life. Retrieved 2010-12-30. PubMed search: "anhydroperoxycostunolide" OR "magnolialide" OR "3-oxo-eudesma-1,4(15),11(13)triene-12,6alpha-olide"